No. That’s the one straight answer I can give you. The chronology is so far apart, and there’s a continent between them. If you know anything about Fear the Walking Dead, you should know the first season picked up at the dawn of the rise of the walkers, when there was a lot of chaos and people didn’t quite know what was going on at first. Because the regular Walking Dead picked up some time after the start of the zombie apocalypse (while Rick had been in a coma) and has already covered six seasons worth of stuff happening since then, the two timelines on the show are extremely far apart and should continue to be far apart in the years to come. Thus, Dave Erickson noted at Paleyfest that a crossover event is unlikely to be in the cards. Rumors about a potential crossover have been happening ever since Fear The Walking Dead was announced. While it makes total sense that the timeline would keep an intense, episode-long crossover from happening on either series, the timeline doesn’t necessarily preclude characters from one show popping up on the other and vice versa. Potentially, a cameo could be even made by a dead character on The Walking Dead who was alive during some of the events in Fear The Walking Dead. Obviously, we know people like Rick and Carl were never in the Los Angeles area, but there are numerous other, smaller characters who could theoretically fit the bill. Still, the logistics of a Walking Dead or Fear The Walking Dead character crossover—even if it were only to happen for a cameo—would be an awful lot to work out. As Erickson noted this weekend, there’s a whole continent of travel between the Walking Dead characters, who live in the southern part of the Unites States and the Fear The Walking Dead cast, who hail from Los Angeles and will be evading zombies from a boat when Season 2 starts. It’s not like how Better Call Saul is set in the same area but on a different timeline than Breaking Bad. 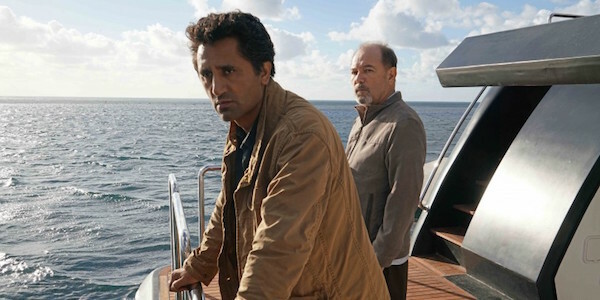 That hasn’t stopped TWD actors from expressing interest in appearing on Fear The Walking Dead, and maybe one day Dave Erickson and the creative teams will be able to work out a big crossover episode. For now, you can catch Season 2 of the spinoff when it hits the schedule on Sunday, April 10 at 9 p.m. ET, replacing The Walking Dead. In addition, here’s what we know about the upcoming season.